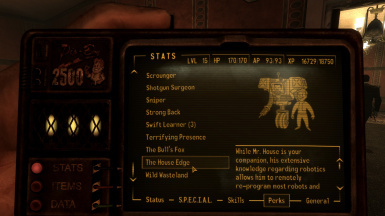 House's Securitron is a fully voiced and fully functional Securitron companion and basically a mobile House; you can ask him anything you can ask House (and more) and progress through the House questline through him. 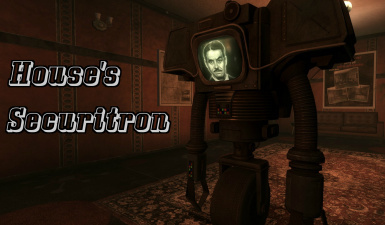 This mod adds Mr. House’s personal Securitron to your game, which is fully voiced using House’s in-game audio files. 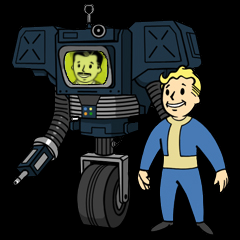 He’s a fully functional Securitron companion and basically a mobile House; you can ask him anything you can ask House (and more) and progress through the House questline through him. Over 500 lines of handpicked, sometimes spliced together, fully voiced dialogue. 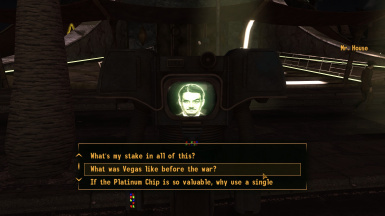 Ability to proceed through the entire House questline via the Securitron; the only times you’ll be required to return to the Lucky 38 is to deliver the Platinum Chip and to start the final battle. 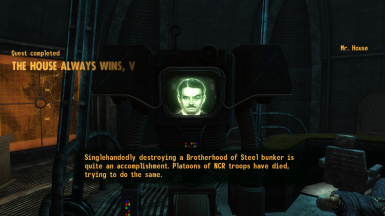 Extensive dialogue options about House himself, his plans, New Vegas, etc. 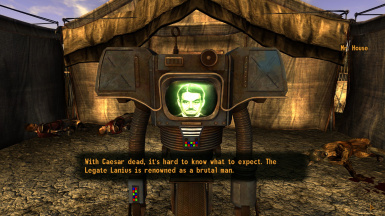 More dialogue becoming available as you progress through House’s quests, or when certain events happen, like after being asked to bug the L38 or when Caesar dies. Spliced dialogue for combat situations: when he attacks, combat starts, combat ends, when he ''dies'', etc. 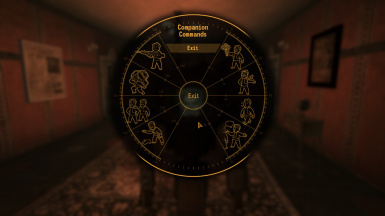 Has all companion functionalities: companion wheel, tactics, wait/follow, go to Lucky 38, etc. Ability to select which Securitron weapons he should use. His Mark II weapons become available after delivery of the Platinum Chip. Fully ''synced'' with the regular, stationary House. If you accept/complete a quest from the Securitron House, the normal House’s dialogue will reflect that and vice versa. If you get hostile to/kill the regular House, the Securitron will get hostile/killed too. 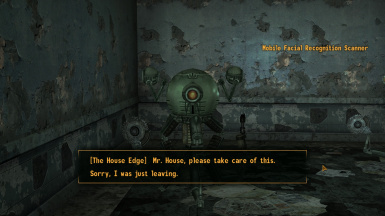 Companion perk ''The House Edge'' with custom-made perk image and added dialogue options to Repconn robots only available with said perk. Ability to tell him to switch to a larger/smaller Securitron when dismissed. The default Securitron unit House uses is smaller than a regular Securitron so it doesn’t get stuck trying to pass through doors. If you want, you can ask him to switch to a normal-sized Securitron instead. Due to how the Securitron’s combat scripts work, House can’t effectively use more than two weapons at once. He’ll end up constantly switching between them instead of actually shooting. If you tell House to use ranged weapons from the companion wheel, he will use the 9mm machine gun + grenade launcher OR, if the Securitrons have been upgraded, the Gatling laser + missile launchers. If you want him to use another weapon set, tell him via the dialogue ''Let's talk about your tactics.'' --> ''I want you to change your combat style.''. 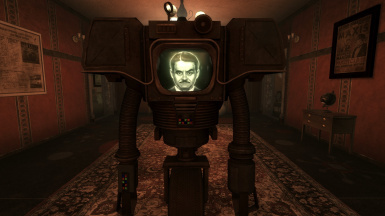 Mr. House counts as a humanoid companion for balancing reasons. You can’t recruit both him and, say, Arcade or Raul at the same time. If you want to recruit multiple companions, get the Unlimited Companions Mod, it works just fine with this one. He’s not allowed to enter the Strip’s casinos with you. You can ask him why and he’ll explain. He’s also not allowed into Caesar’s tent, for obvious reasons. 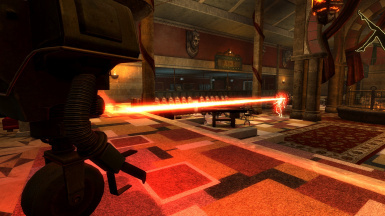 Even though House’s basement presentation shows otherwise, in-game Mk I Securitrons use the 9mm machine gun and grenade launcher, while the Mk II’s use the Gatling laser and missile launchers. The same is true for House’s Securitron. He’s in the Lucky 38’s presidential suite. You can recruit him as soon as you have access to the suite, so right after talking to Mr. House for the first time. Just drop the .esp, sound folder and texture folder into you Data directory and tick the .esp with your mod manager of choice. 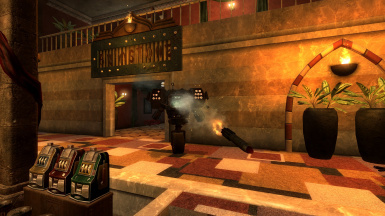 Since House’s Securitron spawns in the Lucky 38’s presidential suite, mods that drastically change the suite might not be compatible. If this is the case, simply use the Penthouse version so the Securitron spawns in the Lucky 38’s penthouse instead of the suite. Might not be compatible with mods that change Mr. House’s dialogue or the Securitrons’ scripts. Any such conflicts are unlikely to cause more than minor issues though.